Yarrow has delicate fern-like leaves that are quite attractive. 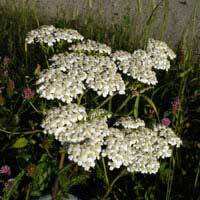 It has flat topped clusters of white flowers that attract butterflies. Very drought tolerant and tough plant.